It is generally accepted in coaching terminology that there are four important phases of the game, defensive phase, transition from defence to attack, attacking phase and transition from attack to defence. In a modern game model, these four are most prominent, there are some coaches that include attacking set pieces and defensive set pieces in this model but I personally do not. From those four phases of our game model we can generally build an analysis of any match by looking at the moments of the game from each phase and trying to piece together the plans of the coach in question. Last weekend, however, saw Borussia Dortmund host RB Leipzig in a match which saw one side play almost entirely in transition whether attacking or defensive. RB Leipzig came out 3-2 winners in a match that was fast and furious but their model of play was interesting. This pass map is courtesy of the excellent @11tegen11 using Opta data and as you can see for a side that won the game there was very little in the way of passing connections between players. In the end, the side from the east of the country managed just 34% of possession but their model of play is indicative of how a team can manage a game and play in their attacking phase utilising rapid transitions. Prior to this match, Dortmund had been superb domestically and in particular superb defensively. Here though they were caught out by the direct nature of the RB Leipzig play and by the relentless pressure applied by the away side. Both sides lined up in their expected systems with the home side in 4-3-3 and the away side 4-2-2-2. The two tactical systems produced an entertaining spectacle. Borussia Dortmund started with Roman Burki in goal behind a back four of Jeremy Toljan, Sokratis Papastathopolous, Omer Toprak and Dan-Axel Zagadou. In midfield, Nuri Sahin played as the controlling midfielder behind Mario Gotze and Gonzalo Castro. The front three consisted of Alexiy Yarmolenko and Maximillian Phillip in the wide areas and Pierre-Emerick Aubameyang in attack. RB Leipzig started with Peter Gulasci in goal behind Bernardo, Stefan Ilsanker, Dayot Upamercano and Marcel Halstenberg. The two central midfielders were Naby Keita and Kevin Kampl with Bruma and Marcel Sabitzer. With Timo Werner still not fully fit they started with Jean-Kevin Augustin and Yussuf Poulsen in attack. There are really very little surprises in the way that RB Leipzig play. 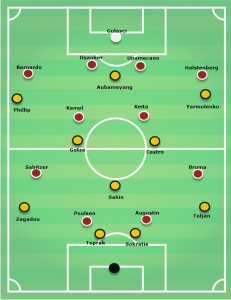 They closely follow the Ralf Ragnick model utilising a variant of the 4-4-2 which can more accurately be described as a 4-2-2-2 with two central midfielders flanked by two wide midfielders who operate more in the half spaces than the wide areas. The key, however, lies in the way that Leipzig press their opponents him in their own defensive third. With two forwards who split wide and either close down the goalkeeper when in possession or cover the pass to the central defenders. Through intelligent positioning of their bodies, the forwards are often able to cover more than one player by cutting off a passing lane. Generally one of the two more advanced midfielders will also join the pressing movement in order to cover another passing angle while the other wide midfielder joins the two central midfielders to prevent the defending team, in this case Dortmund, from playing through behind the initial press. As you can see Leipzig have matched up on Dortmund with 5v5 in their defensive third. Yussuf Poulson has moved in to engage Roman Burki but as you can see he has angled his run in such a way to prevent Burki from being able to bypass the press with a simple pass to Toprak. Three of the other Leipzig players are positioned in a man orientated structure with each being responsible for preventing Dortmund from playing through the press. Such is the conditioning of the Leipzig players they are able to perform repeated sprints for the entire 90 minutes ensuring that they can cover all passing angles for the opposition in this situation. The last man is free in this position to move across the width of the field to cover any pass over the top that is made to play through into the middle or final third. Once again this shows Leipzig pressing initially in a man orientated manner the man in possession and the two immediate passing options, Dortmund like to progress the ball by creating and exploiting triangles through the pitch, the next best passing option for the man in possession is the central player but once again he is closely covered by a Leipzig player. On this occasion, the man in possession chooses to look to play the ball up the line in order to escape the press. There is, however, no player in the wide area and the ball goes straight out of play giving possession back to Leipzig. Dortmund found it increasingly difficult to access the central areas of the field given the ferocity of the pressing from Leipzig. When Dortmund are at their most effective under their Dutch coach Peter Bosz they attack in the first instance through the centre of the field before looking to move into spaces in the final third as the spaces start to develop. Throughout this match, Leipzig worked to deny Dortmund space in the central area in to which they could attack. As you can see from this passing map, again provided by @11tegen11 using Opta data, There was very little by way of active passing connections between the central players in the Dortmund structure. Instead, the strongest central connection is between Omer Toprak and Roman Burki as the former looked to pass the ball back to his goalkeeper when put under sustained pressure from Leipzig. The Dormund fullbacks played in more advanced areas for large periods of the match but this was very much a deliberate ploy from Leipzig to allow Zagadou and Toljan to have possession of the ball in areas from which they could not easily penetrate the penalty area. The controlling midfielder for Dortmund, whether Julian Weigl or Nuri Sahin, tends to be a vital part of their attacking movement. In this match, Leipzig managed to take away the controlling player very effectively. This is an example taken from a period in the match in which Leipzig dropped into a more passive medium block, a switch made occasionally during the game to conserve energy. As you can see the passing options are open in the wide areas and Dortmund are able to progress the ball forwards in the wide areas, this does not, however, mean that they will be able to move through into the final third. This example is taken after Leipzig have gone into a 3-1 lead and they have naturally dropped into a deeper block. The man in possession of the ball has no option to play through into central areas of the field. Instead, the pass out to Zagadou on the left-hand side of the field is open. For the majority of the match Leipzig were content to allow Toljan on the right of defence and Zagadou on the left have possession, neither fullback is by any means a poor passer of the ball but they lack the experience or confidence to play the ball into central areas. Both sides had varying methods in progressing the ball forwards in towards the opposition penalty area. With the option of playing through the centre of the field essentially negated, Dortmund became more direct in looking to access the final third through direct, diagonal passes from the central defenders out to the wide forwards. This is an example of an in-game situation with Dortmund looking to play the direct pass out to the wide area. 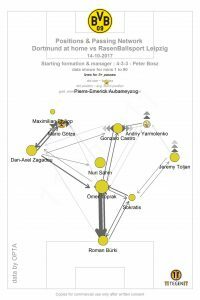 The Leipzig players had once again effectively covered and stopped the most prominent short passing options and Sokratis looked to find Phillip who had moved in off of the touchline. The idea behind this more direct build-up is to immediately offer a platform from which they can build in an advanced area. The issue with this form of progression through the thirds is that the pass has to be accurate and so does the touch of the receiving player. As touched upon previously Leipzig are an incredibly well-conditioned side and they are able to turn and converge on the receiving player quickly in this instance. 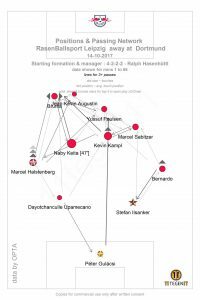 RB Leipzig were also direct with their progression forward but as they attacked in transition and were not looking to sustain possession they did so through direct running into space. Here you can see Naby Keita in possession of the ball as he drives towards the Dortmund defensive line. The two wide midfielders for Leipzig are immediately looking to attack the space in behind the Dortmund fullbacks and the two forwards effectively occupy the Leipzig defensive line. Throughout the match, Leipzig were proactive in attacking the Dortmund defensive line from a variety of angles and at speed, in this, they were very much back to the impressive style of play that we saw last season. This was so far at least the game of the season in the Bundesliga, even with both sides reduced to ten men the tempo remained the same. There were questions before the season started as to whether RB Leipzig could maintain their positive form from last season given the added pressure of European commitments. That they triumphed over Dortmund without three key players, Willi Orban, Emil Forsberg and Timo Werner is testament to the strength of the squad that they have at their disposal.